Keep the kids and passengers endlessly entertained from the comfort of your backseat with the Mazda Genuine iPad Holder. Passengers are able to view and use their iPad more comfortably, with the ability to rotate through 90° in either direction, giving passengers the benefit of landscape or portrait view. Mazda Genuine iPad Holders are tested and validated to meet stringent Australian Design Rules Head Impact Criteria and have undergone rigorous durability tests, with this inclusion of a bump resistant design to ensure the iPad will remain in a secure position no matter how tough the driving conditions. 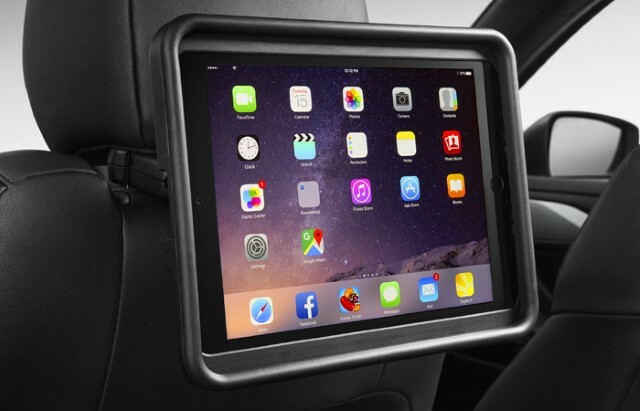 For added convenience, this item also includes an easy-lift design so the iPad can be quickly and easily transferred from the vehicle to any other location. Includes iPad cradle, screen protector and dual USB charger. Compatible with iPad1-4 generation and iPad Air. Please message us your VIN/Chassis number if you would like us to check compatibility of this item to your vehicle.